“Big D” around Dodger Stadium was not a reference to Dallas, but a term of endearment for Don Drysdale, one of the toughest competitors to don a uniform. At 6-foot-6, 216 pounds, the right-handed pitcher would not back down to any batter and believed that he owned the entire plate, not just the outside portion. His sidearm fastball kept hitters frozen in the batter’s box, for fear of getting hit. And with his intimidating style, he pushed them right off the plate. Drysdale hit 154 batters in his career, which is still the modern N.L. record. 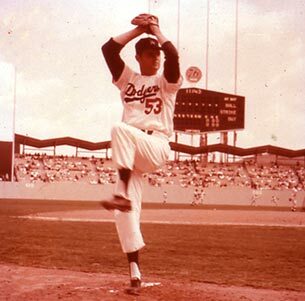 Drysdale pitched for the Dodgers from 1956-69 and, together with left-hander Sandy Koufax, combined to form one of baseball’s all-time best and most dominating duos. Drysdale won 209 games in his career, pitched in 518 games, struck out 2,486 batters and had 49 shutouts. He won the N.L. Cy Young Award in 1962, as he had 25 victories and led the league in strikeouts (232) for the third time. Big D gained widespread recognition for his 58 2/3 consecutive innings scoreless streak in 1968, which included six shutouts, then a major league mark. In 1988, working as a broadcaster for the Dodgers, Drysdale was able to congratulate the man who broke his record, Orel Hershiser, who racked up 59 consecutive scoreless innings. 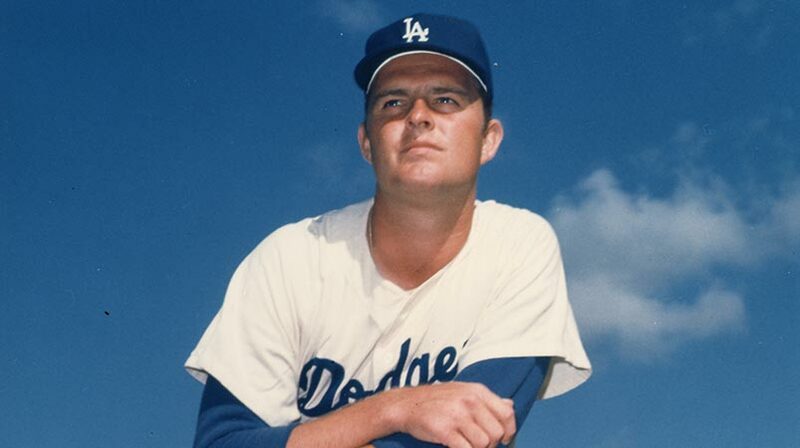 Drysdale played for three World Championship teams — the 1959, 1963 and 1965 Dodgers — and two N.L. 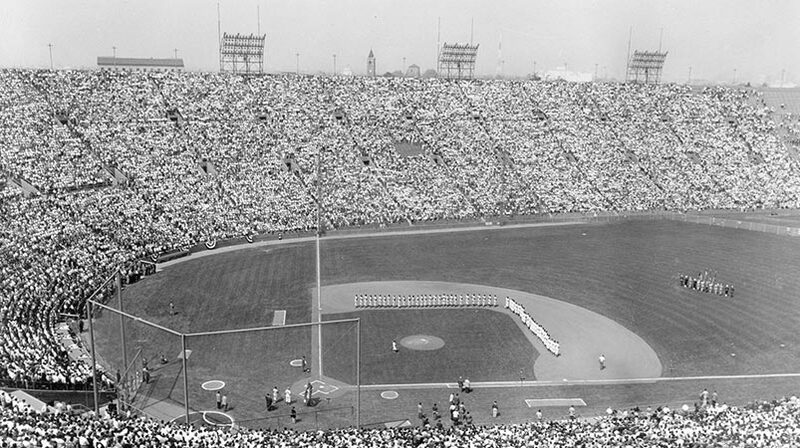 Pennant winners (1956 and 1966 Dodgers). A fine batter, Drysdale hit seven home runs in 1965 and was the club’s only .300 hitter. A nine-time N.L. All-Star from Van Nuys, CA, Drysdale was the winning pitcher in Game 3 of the 1959 World Series, Game 3 of the 1963 World Series and Game 4 of the 1965 World Series. The handsome and popular Drysdale made appearances on many television shows as a Dodger player. He and Sandy Koufax had a double holdout for larger contracts prior to the 1966 season, using well-known entertainment attorney J. William Hayes to represent them. Eventually, Drysdale earned a huge raise to $110,000 for the 1966 season from boss Walter O’Malley. Years later, Peter O’Malley hired Drysdale to work as a Dodger broadcaster in 1988 until his death in July 1993.